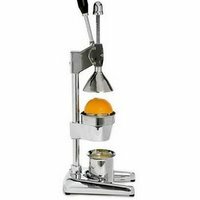 World's most powerful mechanical juicer. More than twice the leverage of other professional juicers. Generates more than 1000 lbs of pressure. Stainless cone and funnel parts. MSRP $125 Based on the Manufacturer's Suggested Retail Price, this juicer is priced about average. Appliance Warranty Lifetime This juicer has a longer than average limited appliance warranty. Again, the warranty is a good indicator of overall durability. Star Rating 3.4 User reviews, ratings, and feedback indicates that this juicer is rated lower than average by 11 users and ranks in the bottom 20% of juicers.